Late Autumn in BC Canada can be brutal. It gets dark early, the temperatures can be frigid, and many times you have to put on a dull winter jacket to get out the door. Still, fret not foodies! Because we got you a list of 4 best Korean food to keep you warm and cozy when it’s cold outside. Without further ado, here’s the list. SURA Korean BBQ serves the best Korean Army Hot Pot, a.k.a Budae Jjigae in S. Korea, in Greater Vancouver, at least in our book. Hahaa. Our Korean Army Hot Pot, a carefully modernized version of this prolific Korean comfort food, is made of ground beef, sliced sausages, spam, baked beans, Korean rice cakes, tofu, and seasonal vegetables. These ingredients develop the hearty broth with a deep and irresistible flavour. Yes, terribly sinful but downright satisfying. Click here to view Korean Army Hot Pot on our menu. You should know how it feels like when you are feasting on a soft and luscious, barbecued beef ribs, especially on oh-so-cold days. At SURA Korean BBQ, you can have these AAA ribs slow-grilled to your liking on the table. Grab a piece of lettuce, dab it with Ssam-jang (sweet-spicy soybean paste), add some tender and succulent BBQ’d ribs. Roll them up into a bite-sized packet and devour it like a boss. Hot, savoury, and crunchy. 10/10 for deliciousness. Click here to view Royal Marinated Galbi on our menu. This is on our must-eat Winter Korean Food list for any first-timers to Korean cuisine. Simmered in the milky broth to tender, the chicken and ginseng are best known to boost your energy and vitality. It is a steaming hot, delicious dish that features a small young chicken stuffed with sweet rice, ginseng, garlic, and jujube. You may have to commit to eating a whole chicken all by yourself, but trust us, it’s totally worth it. Click here to view Ginseng Chicken Soup on our menu. Many Korean people consider Galbi-Jjim as the refined epitome of Korean cuisine. Savoury, short-rib goodness, braised in a sweet & beefy broth with hearty root vegetables. The combination of sweet yet savoury, these juicy & tender beef ribs with a hearty flavour will melt in your mouth. The perfect dish that’ll warm you up and make you feel good. It’s the definition of comfort food. Click here to view Galbi-Jjim on our menu. So what if the weather is a tad chilly? Visit SURA Korean BBQ with your loved ones and settle in. 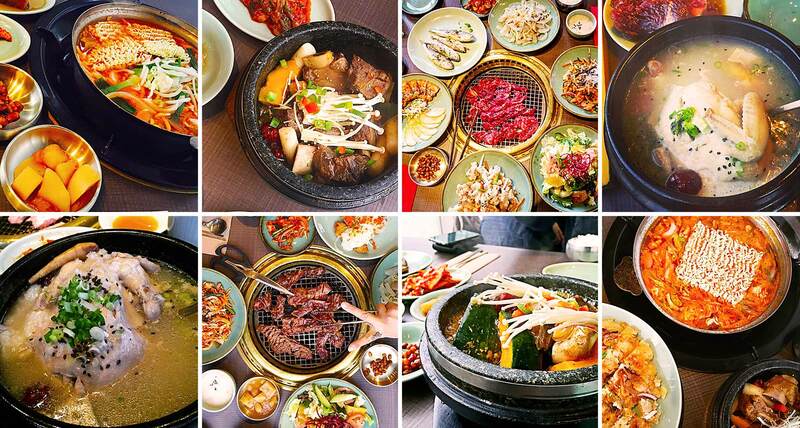 Kick back and enjoy all your favourite hearty Korean Foods. Great thanks to @longmxy, @tracykyl, @michelle_kung, @kahhhlee, @yvreats, @yvreatsquad, @hsoo_91, and @itslulutime for the awesome Instagram feeds!